Description: Hornady A17 Hornady Lock-N-Load Modified Case, 17 Rem There are over 60 different modified cases available to use with Hornady Lock-N-Load Gauge. 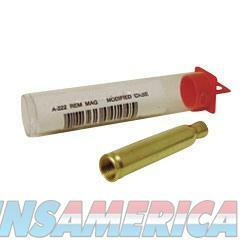 Hornady will make custom cartridges for those not listed. Details are available in the instructions. Modified cases will not work in tight neck chambers, except for the CFG-6PPCT.